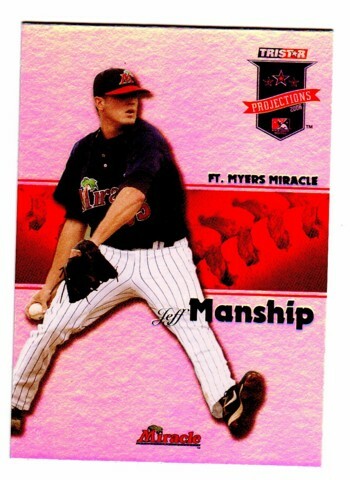 Jeff Manship was drafted by the Twins in 2006 and moved steadily through their system, making his major league debut in 2009. In 2010 he pitched in 13 games for Minnesota, going 2-1 with a 5.28 ERA. He kindly answered my questions about baseball cards. "I would have to say my favorite baseball card of myself would be the most recent Topps card solely because it caught me at a normal point in my mechanics. My mechanics are definitely unorthodox so some pictures catch me at some strange spots such as my 2008 Tri-Star card where my toe is pointed straight up. 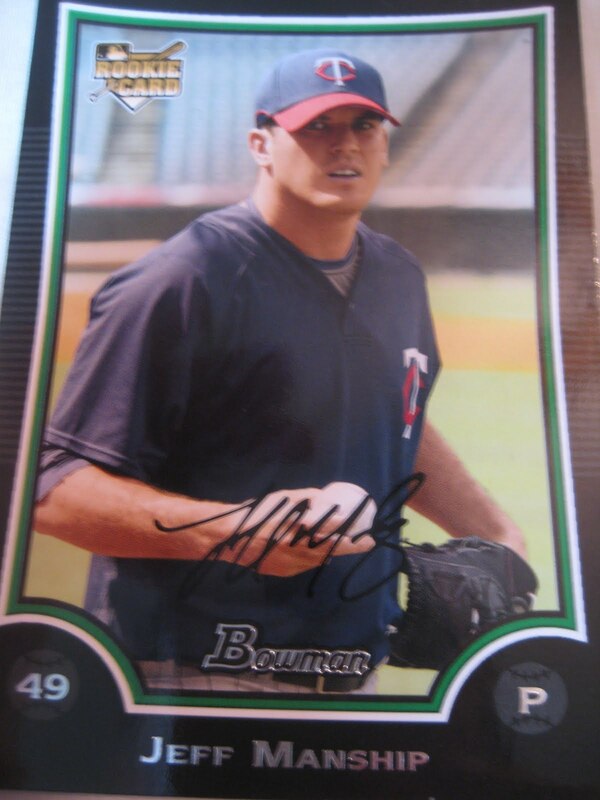 Another card that I'm not too fond of is the 2008 Bowman card. Right before the picture we had our physicals and I had to get my eyes dilated. Florida is a pretty sunny place so I was squinting and crying in the photo. It looks like I got stung in the face by a bee. I was actually a much bigger collector of basketball cards than baseball cards growing up. Anything with Michael Jordan or David Robinson was a favorite. I stopped collecting baseball and basketball cards a while ago. I'm pretty sure all of the cards are in a shoebox somewhere at my parents' house. Hopefully someone didn't throw them all away." Thanks! I don't have any of those cards, but here is one I do have from 2009 Bowman.